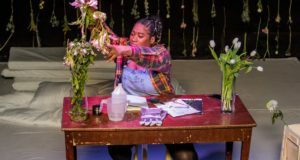 Pros: A witty and bold production with just the right balance of carefully crafted narrative and flexible improvisation. Cons: Some of the text could have been more polished – the occasional Regency period language did not fit in well with the modern setting. 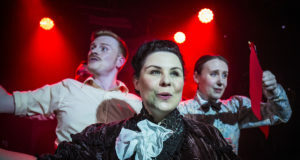 Our Verdict: An immersive, fun, modern adaption of an old classic with matchmaker Emma and her friends brilliantly coming to life. I have to admit that I may be slightly biased in Emma’s favour because the performance’s eponymous heroine found me my very own eligible bachelor in the course of the evening. A modern adaption of Jane Austen’s classic novel, Oneohone Theatre Company’s Emma Woodhouse (played by Lucy Fyffe), is just as much of a lovable, self-appointed matchmaker as the original Emma is. 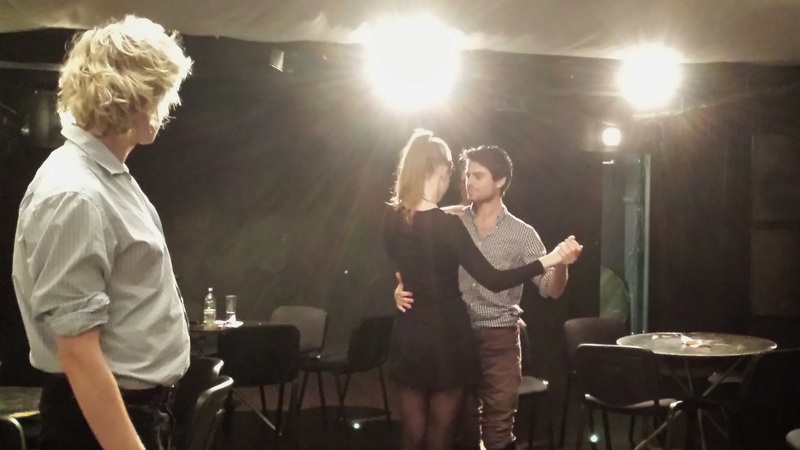 It’s an immersive play, set up as a singles mixer in the Tristan Bates Theatre’s bar, and audience members are encouraged to find their perfect partner through a series of interactive exercises. The other thing I have to confess is that I always get slightly nervous about “immersive” theatre. There is so much potential for things to go wrong – awkward moments, unmotivated audience members, overly enthusiastic audience members. However, our host was utterly charming, and her crew – a watchful George Knightley, played by Rhys Bevan, special guest Frank (Churchill), played by Jeremy Neumark-Jones, and ungainly Ben (Miss Bates), played by Jamie Laird, made sure that we all felt comfortable and relaxed. One exception might have been a certain “audience member”, Augusta (Mrs Elton, played by Harriet Creelman), who tried her damndest to skim off every man in the room. The original novel shines through in a few key moments, as when Emma puts her foot into it by teasingly scolding Ben (reading Austen’s Emma, I would always burst into tears at this abuse of poor old Miss Bates), and when, of course, Emma and Mr Knightely recognise their love for each other. The key characters are there, with their flaws and quirks, but the flow of the action seems left to chance. It isn’t, but this is where the play’s strength lies – it feels very improvised, but the story still unfolds nicely. In the end, we realise that the actor purposefully chose a “Jane Fairfax”, a “Mr Elton” and a “Harriet Smith” from the audience before even starting. Even so, they did not prescribe too much – when Augusta and Harriet (unconsciously played by yours truly) battle in a fierce dance-off for Mr Elton’s admiration, Mr Elton (unconsciously played by a certain Edward, a much lovelier man than the original one) uncharacteristically chooses Harriet. It is a brilliant, witty and fun adaption that allows for the audience to participate and improvise while also telling a coherent story. Even better, it is an enjoyable experience even for those who are not acquainted with Jane Austen’s work. One slight problem was the use of Jane Austen’s language for certain scenes, which did not fit in with the otherwise modern setting of the play. It just didn’t feel quite right. I did like the setting in the bar (with a laptop playing the music) as it enhanced the atmosphere of an informal singles mixer. For people like me, who never carry around cash, it would have been advantageous if the bar would accept cards – the experience would have been made all-round perfect with a glass of wine in my hand. Those are very tiny qualms with an overall fantastic production. If I could, I would go every night – the actors perform in rotas, so Lucy Fyffe, who played Emma when I attended, might play Augusta in the next performance and change the entire mood and feel of the play. It’s a very personal experience, and varies much depending on who’s acting and who’s in the audience. That said, a review just can’t do Emma justice. You might just have to go see it yourself. Emma runs at the Tristan Bates until 29th November.